Our XL Announcement Cards are sure to surprise those who receive them, and even more so if they feature a photo of you or your children! Printed on thick paperboard with unrivalled print quality, the front of each Announcement Card is carefully varnished before dispatch. 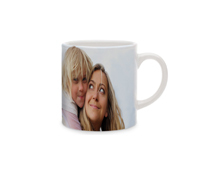 You can personalize the front and the back with photos, text, backgrounds, clipart, etc. and personalize your Announcement Cards 100%!